Archipelago: How Do You Define CM in 100 Words? Where is that quote found? 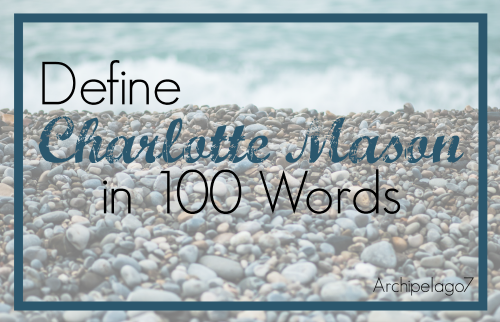 A Charlotte Mason education respects the child's dignity as an individual made in God's image. His education connects him to the world around him, building relationships with God and people from various places and times, and emphasizing outdoor life. Focused attention at short, varied lessons keeps the mind fresh and leaves free time for personal interests. Living books put the child in touch with vital ideas, and narration teaches him to process those ideas. Copywork, dictation, and free-form notebooks replace worksheets. The teacher directs the course of study, but the student has the responsibility to learn. Kathy, thank you for copying and pasting that -- yours is the one I mentioned above. And, yes, it's less choppy than mine! How about "The Supreme Delightfulness of Knowledge?" In a Charlotte Mason education, the teacher brings the child into contact with truth and beauty in all areas, but does not interfere or mediate. The child takes away that which is important to him. The tools of learning are interesting books and ideas, narration and copy work. No interference or mediation is critical. Good point.